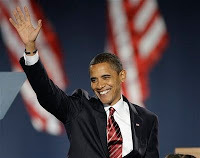 Congratulations are due to President-elect Barack Obama. The election is now over and all Americans will look to Obama to deliver on the promises of hope and inspiration from his campaign. Obama will have a hard road ahead of him to fix the problems that face this country. I hope all Americans can unite behind him on the path towards our common goals. I for one, have full faith in him.